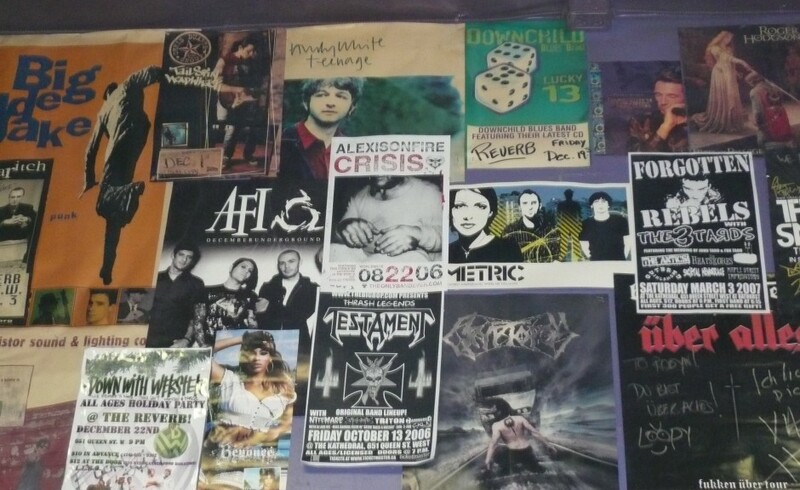 Poster wall of memories. Photo by Lucy Van Nie. In the second half of the 1990s, the iconic purple building on the southeast corner of Queen and Bathurst underwent a transformation from dance club to all-ages live music hub. What now houses a modern furniture and décor store was once home to punk, metal, hip-hop, Darkrave, and a whole bunch of proud music misfits. Club: The Big Bop, 651 Queen W.
History: Often, we must look back in order to move forward. That’s certainly the case with this story. When last we delved into the history of The Big Bop, it was during its period as a dance club owned by the Ballinger brothers. Interviewees for that story were hazy, at best, about the closing of the Ballinger’s Bop. It was clear that the venue had suffered financial hardships from 1994, when it went into receivership, but concrete details about its eventual end – let alone its evolution as a club space – were scant. As it turns out, the original Big Bop continued to operate until 1996 under the management of Peter Ballinger. “Peter was the least seen and the least involved until the Ballingers bought Webster Hall, and the other three brothers – Lonnie, Steve and Doug – were in New York,” recalls Trevor Mais who, as DJ Tex, rocked crowds in the building through three different club incarnations. Mais was an employee at the original Big Bop from 1989, working as busboy, bar back, lighting tech and, from 1993, DJ. While he also did lights at Go-Go and played at clubs including Boom Boom Room, The Phoenix, Joker, and Beat Junkie as DJ Tex, Mais had especially deep ties to Big Bop. He tells me that the club truly struggled from 1995. Various attempts at revival failed. In spring of 1996, the building at 651 Queen West opened as Freedom: The Nightclub.